The Record's Rich Cowen has a nifty story about a Red-tailed Hawk that was found badly injured in Clifton in the spring of 2014 and taken to The Raptor Trust. The Raptor Trust managed to save the bird, and then band and release it. 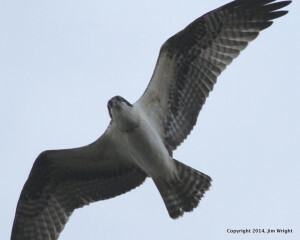 Earlier this month, the Red-tail returned home. An incredible story, and a testament to how concerned individuals can make a difference in a raptor's life -- with the help of wildlife rehab folks like The Raptor Trust. Without the band, by the way, no one would have ever known that the Red-tail made it back home. I had photographed this weed along Parnell's Path on 7/25/2015, and fleetingly wondered what it was. Never got around to trying to figure it out. Rob Fanning's recent three-day sighting of a Louisiana Waterthrush got folks scouring the Celery Farm on Saturday morning. Alice Leurck was able to photograph this waterthrush, the Louisiana's northern cousin. More on IDing Louisiana Waterthrushes here. The charts say the moon is fuller in Aug. 30. Both are right, but why? Think of it as an early Monday Morning Mystery. Don Torino's latest column for the Meadowlands Nature Blog is on the annual late-summer changing birdscape there. Here's a sample: "The skies even look different now for those who take the time to look beyond the turnpike traffic and the jet noises. "The cloud formations are changing, and the Meadowlands’ beautiful sunsets are now taking on distinct colors and hues, with the days becoming shorter and the night breezes a little cooler."